The Duke and Duchess of Cambridge has released an official birthday picture to mark Prince George’s fifth birthday. Prince George Alexander Louis - known as His Royal Highness Prince George of Cambridge - was born on 22 July 2013. Prince George, who turns five today, is photographed in the garden at Clarence House in London after the christening of his younger brother, Prince Louis earlier this month. Clarence House is Charles' home. The Cambridges' home is in Kensington Palace. Right. But the picture was taken in the garden of Clarence House. Such a nice picture, it puts a smile on my face and lifts the mood. Yes, but the picture taken was part of the official photoshoot after Prince Louis' christening, so it was, in fact, taken in the garden of Clarence House, where the family gathered after attending the church ceremony for a small reception as well as for taking pictures. Yes, the photo was taken on the day of Prince Louis's baptism, at the reception at Clarence house. We all know that but the celebration of Prince Louis'christening was at Clarence House, so the picture was taken there! The photographs were taken in the Morning Room of Clarence House - Prince Charles home - (at 4.50pm if you must know), and not at KP, the home of the Cambridges. Gabriella. Yes, you are right, but the photograph was taken on the day of his brother’s christening at Clarence House. 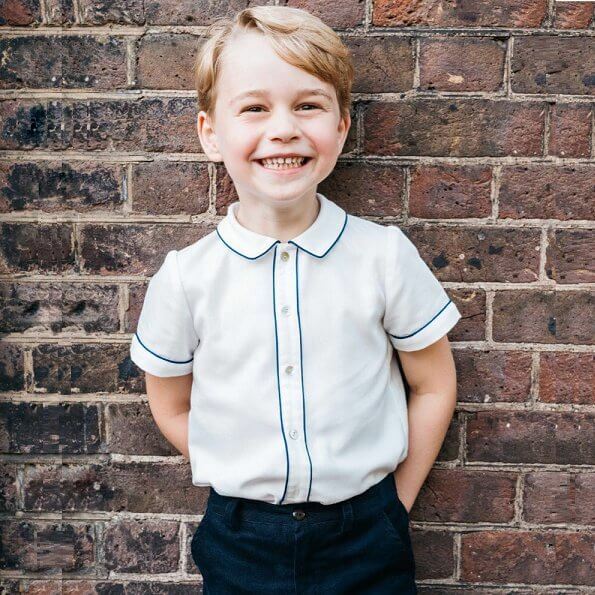 Happy 5th birthday to Prince George ! Wonderful pic of little sunshine Prince George ! Correct, but is there a reason why the young prince might not be photographed in the garden of his grandfather's home? He's such a cutie :-). But he's a five-year-old now, and I think this is the last time he should wear this particular type of shirt. (It can be passed along to his little brother in time). I agree with Jane, he is a very cute 5 year old kid but still dresses as a much younger boy. Five already? What a lovely little boy! Hello cutie. Happy 5th Birthday.Enjoy the day and the presents. This Weekend Pss Theodora of Sayn Wittgenstein Berleburg was married to Nicholas Bethlen they married in Germany. Related to the Hs. of Bayern Denmark and lots more. Her sister is Pss Anna of Bavaria her, brother is Prince August of Berleburg he is an Actor. If interested please check it out. Royalty overload. Yes maybe some don't know who they are or don't care because of Defunct House,but History non at less. Real cutie pie there, so precious. he's so adorable on this pic! that smile! Ein kleiner Lauser ,süsses Foto von George! !